PokerStars is by far the largest poker room online. They have the most traffic to their cash game tables, the largest tournament turnouts, the biggest guaranteed prize pots, and the most copious active member base. PokerStars has been around since 2001 and lot of things have changed during the years. 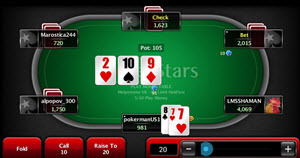 Once upon a time, PokerStars’s most fierce rival was Full Tilt Poker, but that is no longer the case since PokerStars purchased Full Tilt Poker in 2012. Also, PokerStars is no longer a free-standing company; it is owned by the Canadian gambling giant Amaya Inc.
PokerStars was originally based in Costa Rica in Central America, but is nowadays based in Isle of Man in Europe and operates with an Isle of Man gambling license. PokerStars.eu is run by a Maltese subsidiary with a Maltese gambling license. PokerStars has also set-up country-specific poker rooms online to comply with country-specific gambling legislation, e.g. PokerStars.fr och PokerStars.it. These poker rooms have a gambling license from the country in question. PokerStars has its own proprietary poker software. 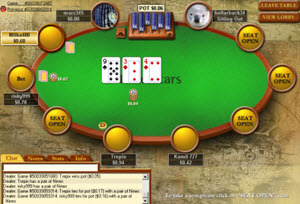 You can play in your web browser or download a poker client. There is one client for Windows and another one for Mac OS. Mobile apps are available for mobile play on smartphones and tablets. PokerStars has a huge selection of poker variants and includes community card games, draw poker games and stud poker games. Mixed-games like H.O.R.S.E and 8-game are available as well. PokerStars has a huge selection of poker tournaments available year round, both scheduled tournaments and Sig ‘n Go tournaments. The two high points of the tournament calender however are the annual PokerStars World Championship of Online Poker (WCOOP) and PokerStars Spring Championship of Online Poker (SCOOP). As soon as you complete the registration process, you get a $20 no deposit bonus from PokerStars. You get a match bonus on your first, second and third deposit to PokerStars. Each match bonus is a 100% bonus. You can get $600 in bonus money by taking full advantage of this offer. PokerStars always has a multitude of campaigns running. Some are for all players, some are for certain geographical areas only. Since PokerStars sponsors several major poker tours, they have a huge number of travel packages to hand out. You can win a travel package to coveted events such as European Poker Tour (EPT), North American Poker Tour (NAPT), Latin American Poker Tour (LAPT) and Asia Pacific Poker Tour (APPT). Each year, PokerStars sends droves of players to Aussie Millions, World Series of Poker (WSOP) and World Series of Poker Europe (WSOPE). PokerStars Casino is filled with table games, five different video poker machines and a large number of slots. Certain tables for roulette and blackjack are available in both single-player and multi-player mode. The slots comes from several different game developers, including NetEnt, NextGen and Quickspin. Playing casino games in PokerStars casino is a good way to learn how to play different casino games. You can do it directly from your home and you do not risk embarrassing yourself in front of strangers. You can even play the games for free if you want to. I recommend this website if you want to learn the rules of different casino games before you start playing them online. Blackjack, Roulette and the Live Casino are available for mobile play. Apps can be downloaded for iOS and Android. Regrettably, the PokerStars customer support can only be reached by email. There is no phone support or live chat support. The email address is support@pokerstars.com. For questions regarding deposits, you can send you message directly to the Deposit Assistance Department by using the email address dad@pokerstars.com. Since PokerStars and Full Tilt Poker have the same owner, it is possible to move money directly from your PokerStars account to your Full Tilt Poker account and vice versa.